In December 2015, the world’s leaders will gather in Paris, France to finalise negotiations for an ambitious global agreement that limits the world to a less than a two degree Celsius rise in global temperature. Many believe it is the most significant global negotiation with towns and cities having a critical role to play. “Local government is where the rubber hits the road when it comes to responding to the human impacts of climate change. We fully support funding for cities, towns and municipalities for their registered adaptation actions.” Margareta Wahlström, The Special Representative of the UN Secretary General for Disaster Risk Reduction. Many municipalities in Canada have completed climate action or community energy plans and have established GHG emissions reductions targets. The Paris negotiations lend new urgency to those efforts, a new opportunity to reengage, reframe, reconsider and reinvigorate. • What and what else can my community do to reduce GHG emissions? • How can my community engage in the negotiations? • What are other communities committing to do? • What are other sectors of society doing? • What are the highlights of key reports on climate change science, investment, energy technologies that will be released in the run-up to the Paris meeting? We will deliver this information through a biweekly newsletter, periodic webinars and e-dialogues. During UN negotiations in Lima (December, 2014) and Paris (December, 2015), we will provide a live stream of developments through @SSG_News and a digest in the newsletter. Our goal is to empower municipalities, counties and regional districts in transitioning to a low carbon existence. Municipal, County and Regional District staff, elected officials. Sign up here for the newsletter and share with colleagues. What is the Pathway to Paris initiative? 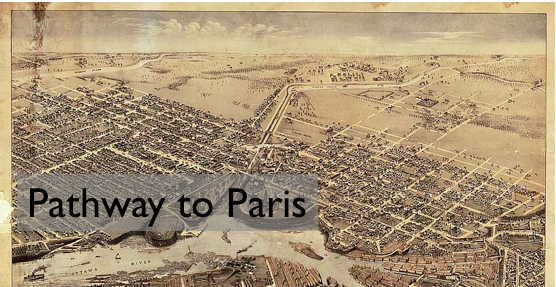 Pathway to Paris is a unique endeavour that bridges several of SSG’s key areas of focus: municipalities, cooperatives and the cultural industries*. We are building bridges between each of these areas to confront one of the greatest challenges we have ever faced: climate change. SSG is a workers cooperative; one of the seven principles of cooperation is concern for community. This is our effort to manifest that principle. There are discussions happening at a high level that affect every single person on this planet, to step up and be responsible for their impact on their local environment. As a municipality, who also represents you and I, we encourage you to pay attention to our feed over the next year. Not only to keep abreast of the decisions that affect you, but to have a foot in where there is opportunity to thrive.. and dare we say it, have fun. Join now! 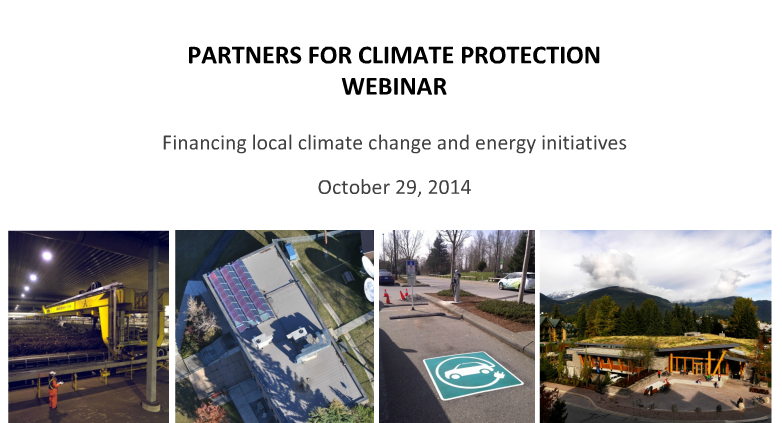 Webinar: Innovative ways to finance climate change and energy initiatives in municipalities. Yuill was asked to join this panel for the Federation of Canadian Municipalities (FCM) to share innovative ways to finance climate change and energy initiatives in municipalities. The panel was on: Developing and financing actions or strategies to achieve community energy and emission plans (CEEPs); evaluating the economic and employment impacts of a CEEP. Innovative financing tools have boosted local climate change and energy initiatives in many Canadian municipalities. Using alternatives to traditional mechanisms, these municipalities have found flexible ways to implement programs in a cost-effective and practical manner. In a recent webinar, PCP members heard about the City of Nelson’s EcoSave energy retrofit program that encourages improvements to household energy efficiency. Other examples include the City of Yellowknife and the District of Saanich, and their approaches to establishing capital reserves and carbon funds as a dedicated revenue source for municipal energy initiatives. http://www.ssg.coop/wp-content/uploads/2016/01/Screen-Shot-2016-01-11-at-12.47.54.png 583 782 Jeremy Murphy http://www.ssg.coop/wp-content/uploads/2015/01/ssg_logo.png Jeremy Murphy2014-10-29 07:48:272016-01-12 11:45:44Webinar: Innovative ways to finance climate change and energy initiatives in municipalities.